Real Quick. Humor me. It's April Fool's Day. I usually don't care too much unless I'm the guy going out to see my "flat tire" is not really flat! Today I gave a short update on Twitter: "I am getting married on Saturday!" to which I only managed a few responses ranging from "Congratulations" to "Shut Up". To those I didn't trick, I tried to employ their deceitful ways, but in the end, my joke was basically unsuccessful and I gave up. Cry! But my "joke" is not fiction. You see, thirteen years ago, on April Fool's Day, I had the pressure of delivering that very message to my mother, father and teenage sister, one-by-one. I am pretty sure my sister said "Shut Up!" too. Yes, I got married in White Plains City Court on what I guess normal people would call short notice. The End! That is the ultra-simplified-short-version, but no, there were not any pregnancies forcing a rush! Thanks for wondering, though. 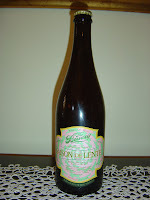 Tonight I'm drinking Saison de Lente, a Belgian-Style Saison Ale brewed by The Bruery in Placentia, California. From what I gather, Saisons are made with a psycho yeast strain called Brettanomyces (Brett) which provides this "barnyard" or "funk" flavor. I've had this style before, but that's probably the best description I've delivered to you, and I'm starting to figure out if I like the characteristics of this style or not (or not yet). This bottle is presented beautifully as usual with pink and robin's egg bluish aqua colors on a brown wine-sized bottle. OK. No jokes--I am trying to out-do those designers you see on late-night TLC. (Remember, I am married). If you look closely at the pattern, you will see the blue is actually a circular pattern of bunnies around a decorated Easter Egg. Yes, the bottle says this would be nice for an Easter celebration. Well, how about a Thursday-before-Easter celebration? I think so! Ideal serving temperature: 50 degrees F. Check. Grassy, lemony citrus aroma. There are lots of ripe peaches and apples and other fruits there, too. A very bright, powerful aroma. OK, it's sunshine! I can't remember ever commenting on the appearance of a pour, mainly because I think that in general is pretty inconsequential to the experience and therefore a dumb waste of time, but damn if this head isn't the fluffiest, puffiest, foamy thing I've ever seen! The flavors are subtle yet complex right from the start. Grainy with some light lemon to start. Tangy and bitter all rolled into one. There is also a little bit of fruit, but much less than the aroma. And for sure you will taste this barn experience that is all the rave, although it tastes more wet-towelish to me, not that there's anything wrong with that! Good medium carbonation draws the flavors forward, and you will end with a dry aftertaste. It was unexpectedly refreshing despite the Brett. I guess I am still figuring this style out. But if you want to meet a real Brett-crazy lady, here is your Queen. BTW, I am expecting her to eventually show her face in the halls here, so keep watching! 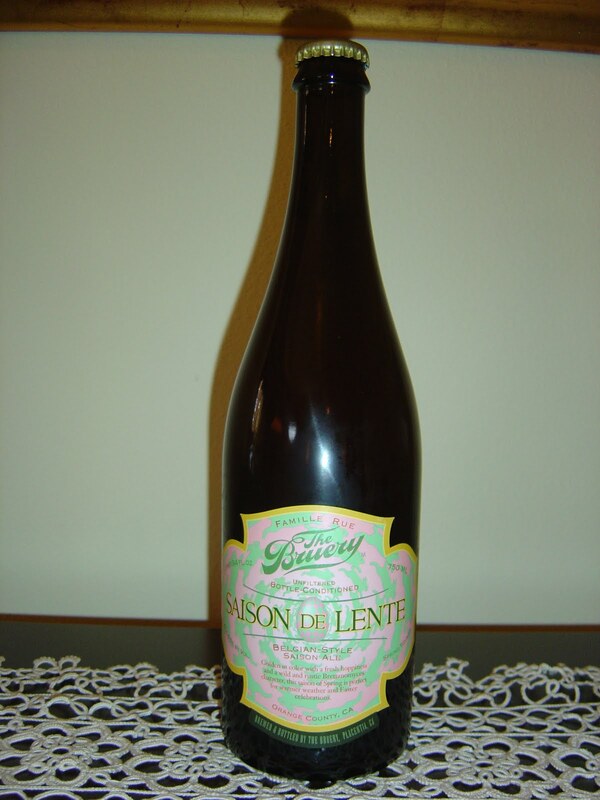 Saisons do conjure up ideas of Spring/Summer so I'm glad we have one on tap at KegWorks right now - I haven't had Saison de Lente yet but the ones I've had I've enjoyed... come to think of it, I've yet to enjoy ANYTHING from The Bruery (but always wanted to). Have you had many Biere de Garde's? Biere de Mars has quite a bit of brett in it as well, if you're looking for others to try to decide if you dig it or not. For me, I have to be in the mood. Great post. Keep 'em coming. Thanks, Hannah. I don't know, this style is OK once in a while, but I love me a great IPA and a rich thick stout more!